The case for surprising gains from one of the market's biggest stocks. Procter & Gamble (NYSE:PG) shareholders are happy to put 2016 behind them. Their stock badly trailed the market as P&G posted its third-straight fiscal year of slowing sales growth and declining gross profit. Income investors weren't spared the pain, either. They received the smallest possible dividend raise last year while the consumer-goods giant struggled with an elevated payout ratio. A new year doesn't bring a clean slate to companies, and that's especially true for $220 billion titans like Procter & Gamble. However, P&G has a real shot at surprising investors by posting improved operating and financial results in 2017. Here's how. The company has been forecasting a sales-growth rebound for years, but hasn't delivered. Instead, the pace of organic sales gains fell to 1% in fiscal 2016 from a disappointing 2% the prior year as market share ticked lower across its major product categories. That's a big problem, since P&G's operating model depends on, as management puts it in the 10-K, "organic sales growth above market growth rates in the categories and geographies in which we compete." Rather than hitting those targets, P&G has watched as rivals like Unilever (NYSE:UL) and Kimberly-Clark (NYSE:KMB) outpaced it by 2 percentage points or more in the last year. There are encouraging signs that this poor trend is about to change. Last quarter, P&G posted its best sales-volume performance of the year thanks to demand strength in some of its biggest brands. After stumbling badly in shaving, for example, it appears to have hit on the right mix of products, pricing, and marketing in the category. Its online subscription plan is also finally mounting a serious response to Unilever's Dollar Shave Club. Organic sales-growth momentum. Image source: P&G investor presentation. Gillette razors count as one of just 66 franchises remaining after P&G has whittled down its portfolio by about 100 brands. Executives believe they have the best chance at above-average growth with the group that's left, and 2017 will be the first real test of that theory. The more manageable portfolio isn't the only change that's making P&G look like a stronger company in the new year. Its expenses are also plunging thanks to cost cuts that have cleaved $7 billion out of its overhead burden since 2012. Executives are targeting another $10 billion of savings over the next five years. And while unfavorable foreign currency swings and the one-time impact of brand sales offset most of those gains last year, these headwinds are disappearing. P&G is on track to hit its long-term earnings growth target in fiscal 2017 after missing it badly over the past two years. Annual cost savings through fiscal 2016. Image source: P&G investor presentation. There's a decent possibility that the company overachieves on earnings. The brands that it has sold off over the last few years produced weaker-than-average profit margins, which means the remaining brands should lift the company's overall figure higher. Under the best-case scenario, P&G will be able to consistently hit higher operating profits so that it can raise its long-term earnings-growth forecast from its current mid-single-digit range. P&G could still pleasantly surprise its shareholders by posting stronger cash generation, even if blockbuster earnings growth doesn't materialize. It targets converting at least 90% of earnings each year to free cash flow, but last year, trounced that forecast by producing $12.1 billion, or 115%, of adjusted profits into cash. 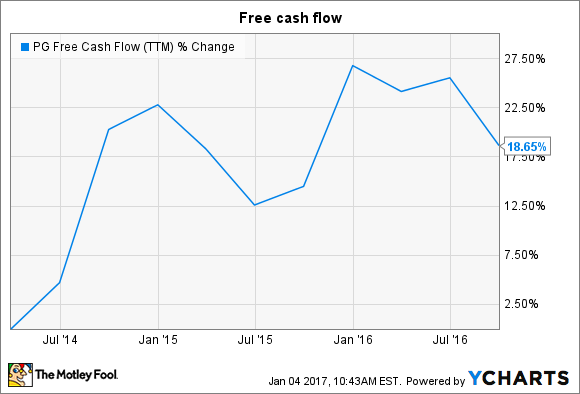 PG Free Cash Flow (TTM) data by YCharts. The priority for those funds is investments into initiatives that boost revenue over the long run, like research and development, sampling programs, and advertising. But with P&G's ultra-efficient operations, there's usually plenty left over after spending on the business. That's why investors can expect record levels of shareholder returns in 2017 that might set the stage for market-beating stock-price appreciation.